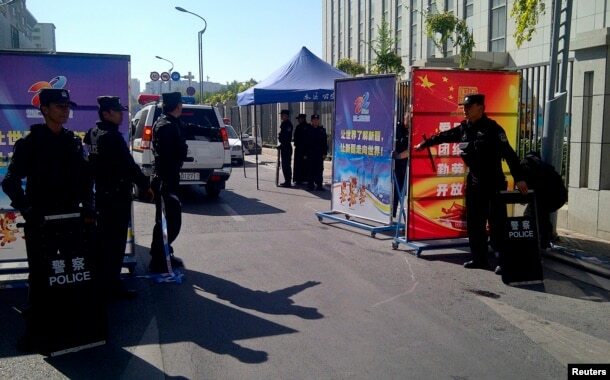 A prominent ethnic Uighur rights group says it fears China will exploit a Uighur militant’s suicide attack on its embassy in Kyrgyzstan last week to repress minority Uighurs in the neighboring Chinese region of Xinjiang. In its first detailed public response to the August 30 suicide car bombing that killed only the attacker and wounded several Kyrgyz security guards at the Chinese embassy in Bishkek, a World Uyghur Congress representative told VOA that his group condemns the Bishkek blast and “all kinds of terrorism”, including what he referred to as “Chinese state terrorism” against its own people. WUC’s Washington-based vice president, Omer Kanat, was referring to the Chinese government’s crackdown on Uighur militants whom Beijing blames for several deadly attacks on civilians around the country and for sectarian violence between minority Uighurs and majority Han Chinese in Xinjiang in recent years. Kanat said he expects Beijing to use the Bishkek attack as a pretext to intensify what he called its ongoing crackdown against the Uighur people – mostly Muslim Turkic-speakers living primarily in Xinjiang – and to “further restrict their religious and cultural rights.” Many Uighurs accuse Chinese authorities of persecution and turning them into a minority in their homeland by flooding it with Han Chinese settlers. China has said it grants Uighurs wide-ranging freedoms. 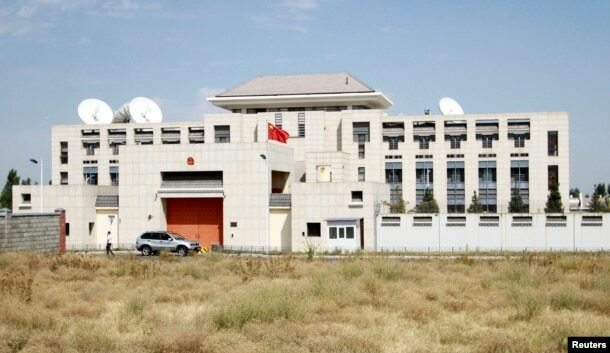 A general view shows China’s embassy in Bishkek, Kyrgyzstan, August 30, 2016. Kyrgyzstan named the embassy bomber as Zoir Khalimov, a 33-year-old Uighur with a Tajik passport and a member of the East Turkestan Islamic Movement, or ETIM – a separatist group seeking to split Xinjiang from China. Bishkek also said it believes the attack was masterminded by Uighur militants fighting alongside other Islamists in Syria. Chinese foreign ministry spokeswoman Hua Chunyingsaid Wednesday Beijing will be “firm” in fighting what she called ETIM’s “bloody crimes” and in cooperating with Kyrgyzstan and other nations to combat terrorism. Kanat said his rights group believes Beijing will use its economic influence in neighboring Central Asian states such as Kyrgyzstan to pressure them into suppressing dissent within their Uighur communities as well. A 2012 Canadian government report said at least 50,000 Uighurs were living in Kyrgyzstan, accounting for almost one per cent of its population. Uighur militants rarely have targeted Chinese people or diplomatic missions abroad. But the risk of further attacks is “substantial,” according to Raffaello Pantucci, director of International Security Studies at London’s Royal United Services Institute. FILE – Police with riot gear guard a checkpoint on a road near a courthouse where ethnic Uighur academic Ilham Tohti’s trial is taking place in Urumqi, Xinjiang Uighur Autonomous Region, Sept. 17, 2014. In an interview with VOA’s China 360 podcast, Pantucci said videos, photos and messages from recent battles in Syria and Iraq show that several hundred Uighurs have traveled to those countries to fight on behalf of Islamist groups Jabhat al-Nusra and Ahrar al-Sham. “We also have seen through various leaks of documents of the Islamic State militant group that it has at least 100 or 200 fighters from the Uighur community,” he said. Sean Roberts, a professor of international affairs at George Washington University in the U.S. capital, told VOA China 360 that jihadists have been recruiting Uighurs from among refugees fleeing the Chinese government’s security crackdown in Xinjiang. “The Uighurs are not necessarily militants when they leave China, but as they move through Southeast Asia with the help of human trafficking networks, more and more of them are being recruited by various radical groups,” Roberts said. Many Uighur refugees have been transiting Southeast Asia en route to Turkey, which has strong cultural links to Uighur communities. FILE – Suspected Uighurs from China’s troubled far-western region of Xinjiang, sit inside a temporary shelter after they were detained at the immigration regional headquarters near the Thailand-Malaysia border in Hat Yai, Songkla, March 14, 2014. Roberts said people who spoke to radicalized Uighurs in Syria told him the militants hoped to get combat experience to someday liberate what they perceive as their homeland inside China. But he said many of them likely will die fighting before they can try to carry out attacks like the one in Bishkek. “The greater threat to China from terrorism is that militants besides the Uighurs also begin identifying China as an enemy of Islam,” said Roberts. World Uighur Congress’ Kanat said he is aware of the problem of Uighur radicalization. He said some Uighur refugees have told him that Islamist radicals approached them in Thailand and Turkey, promising housing and money if they went to Islamist-controlled parts of Syria and Iraq, countries that he said the refugees know little about. The rise of the Uyghur education movement played a significant role in the emergence of the Uyghur intellectual class. The Uyghur education movement, which started in the 1920s and 1930s, was shaped and mobilized by three groups within Uyghur society. The first group consisted of businessmen and merchants who traveled abroad and saw the development of neighboring nations. They include the Musabay brothers’ family, the Muhiti brothers, Tash Ahunum, and others. They built schools and funded these schools with their own resources, thereby assuring the continued existence and expansion of these schools. The second group was made up of intellectuals who were trained abroad. The representatives of this group included Mesut Sabiri, Memet Eli Tewpiq, Tursun Efendi, Qutluq Shewqi, and the founders of Ili educational associations, including Merup Seidi, Teyiphaji Sabitof, and other intellectuals that had returned to East Turkistan from the Soviet Russia before 1932. The third group comprised religious scholars who were part of the Jadid movement. Figures from this group include Abdulqadir Damolla, Sabit Damolla, Abdukerimhan Mehsum, Shemsidin Damolla, and Muhemmed Imin Bughra. In the 1930s and 1940s, a significant number of Uyghur intellectuals emerged as a result of the advancement of Uyghur education. Central Asia became a major resource for Uyghur intellectuals, and the number of intellectuals who were trained in different fields of the arts and sciences in universities in this region increased, and the standards of scientific endeavor advanced. Various associations took action in the field of education. In this period, a generation of Uyghur intellectuals, with university or high school degrees, was cultivated. These intellectuals played the role of promoters, organizers, and leaders of a broad-based political movement in the 1930s and 1940s. In this paper, I focus on the role of Uyghur intellectuals in the political life of the Uyghurs in this period and explains their basic ideas. In the 1930s and 1940s, the Uyghur nationalist movement increased its strength, transforming into a national independence movement that aimed to construct Uyghur national identity and establish Uyghur statehood. It achieved its first accomplishments in two different times. National sovereignty with self-determination was established in Kashgar on November 12, 1933, and in Ghulja on November 12, 1944. In this nationalist movement and in various independence struggles, Uyghur intellectuals played an active and significant role. Of course, the members of the Uyghur intellectual class of this period were deeply influenced by ideological struggles and opinions of the countries that they were trained in. They applied the principles of the ideological movements and strategies of political struggles they saw elsewhere to the national independence struggle of the Uyghur people. The external ideologies that they encountered or they accepted were directly related to the Uyghur political struggle in the first half of the 20th century, to the principles of sovereignty of the two Eastern Turkistan Republics, and to their state ideologies and goals. In my opinion, it is possible to make a tripartite classification of the ideological sources and philosophical trends of the Uyghur intellectual class in the first half of the 20th century. 1. Ideals for establishing an independent Turkic republic based on Turkic nationalism and Islam as the official state religion. The source of this idea was the awakening and blossoming of Islamism in the Muslim world, including northern and western Asia, calls for independence there, and the goals of establishing independent states by bringing together the Turkic nations, and the Idil-Ural Turkic people of Eurasia. 3 universities in these cities, and went back to their own homelands, with the aim of launching an education movement and of strengthening political and national identity in Eastern Turkistan. Several progressive Uyghur religious scholars, including Abduqadir Damolla, Muhemmed Imin Bughra, Sabit Damolla, Abdulla Damolla, Shemsidin Damolla, and Qutluq Haji Shewqi, were not only the leaders of the reform and education movements among Uyghurs. They also aimed to promote and carry out principles based on republicanism and national independence. Almost all of them had lived for long periods in Muslim countries, including Turkey, and in a number of cases they were also educated in these countries. They were thus influenced by the ideological trends in these countries and tried to apply these ideas to the political life and destiny of the Uyghurs. Although these religious scholars, under the leadership of Sabit Damolla, aimed to synthesize Islamic and Republican ideals, their main aims were to establish a state with national characteristics and to bring under one rule Uyghurs, Kyrgyz, Kazakh, Uzbek, and other Turkic nations. The “Association of Independence,” which was founded in 1933 in Kashgar,4 took the organizations of the “Young Bukharanias”5 and “Young Khivans,”6 which had existed in Central Asia at the beginning of the 20th century, as a model. After May 1933, when Kashgar was under rebel control, the Association of Independence actively offered programs about the republican system of government in Kashgar and created the first parliament in East Turkistan – Kashgher Millet Mejlisi. All members of the Association and representatives of local intellectual, religious, business and agricultural circles in Kashgar participated in this congress.8 The Kashgher Millet Mejlisi (Kashgar People’s Congress) had the military and administrative authority to decide government policy and to appoint certain high-ranking officials. The Congress tried to avoid the old Chinese system. The Association of Independence was a cornerstone of the East Turkistan Republic and actively tried to unite all the guerrilla groups while preparing the political and nationalist foundations for an independent state. Some of the Uyghur and Uzbek intellectuals in Kashgar and opinion leaders with Jadidist and pro-independence ideals, as well as political figures who participated in the political events in Central Asia of the 1920s and 1930s—especially those involved in the activities of the Shurai- Islamiye Organization—took part in the Autonomous Government of Turkistan, engaging in proindependence movements which were later labeled as basmachi and condemned by the Soviet Union.9 Some of the participants in the Association of Independence were familiar with Turkic national state ideology and the Soviet–Russian state administrative system in Central Asia through their experiences with the Turkistan Autonomous Government in Kokand. The “formal” beginning of the “Basmachi” movement is usually associated with the Tsarist Imperial Decree of June 25, 1916, which ordered the first non-voluntary recruitment of Central Asians into the army during the First World War.10 The movement was a reaction not only to conscription, but to the Russian conquest itself and the policies employed by the tsarist state in Western Turkistan. After communists destroyed the Turkistan Autonomous Government in the Ferghana Valley, the struggle of Muslims of Western Turkistan against communists not only continued, but escalated in intensity. The struggle continued under various methods well into the 1930s. Participants in anti-Soviet, anti-Russian national liberation movements, such as Setiwaldijan, Yusufjan, Sofizade, Chipaq Ghazi, Janibek, and many others, had escaped to Kashgar in the 1920s and 1930s. They not only participated in the national liberation movements and actively supported and participated in establishing the Eastern Turkistan Republic in Kashgar but also took charge in leadership positions in the government. sent to Kashgar by the Turkish Youth Union in the fall of 1933.16 These intellectuals actively participated in various projects in this shortlived republic and in the enlightenment movement in the Kashgar-Artush region, until the repression by Sheng Shicai in 1937-1938. Most of them were killed by Sheng. According to James A. Millward’s analysis, a high percentage of the ETR leaders were educators or rich merchants from Kashgar-Artush area, and had been associated with the Uyghur enlightenment movement of the 1910-1920s.17 Among the sixteen members of the cabinet, ten of the ministers were intellectuals who had lived abroad for long periods and who were educated in these countries. Prime Minister Sabit Damolla traveled to and was educated in Egypt, Turkey, Saudi Arabia, the Soviet Union, and India.18 Sabit Damolla was also a teacher at the Karakash New Islamic School and therefore a supporter of Muslim education reform. In addition to his status as a religious authority, Sabit had recently returned from the Hajj in 1933 and was heavily influenced by Islamic reform movements during his journey through India, Egypt and Turkey.19 His personal secretary, Telet Musabay, was trained in Istanbul and Moscow.20 The secretary for foreign affairs of ETR, Kasimjan Haji, was educated in India. Intellectuals from a diverse range of backgrounds also played important roles in drafting the constitution of the Eastern Turkistan Islamic Republic and in writing up the declaration of state, and other related state programs. They were also influential in the establishment of diplomatic relations in a very short period of time and in the diplomatic activities of the republic. These nationalist Uyghur intellectuals, by paying attention to the political, social, economic, and cultural situation of Eastern Turkistan in the 1930s, and by taking into consideration different factors, including its external relations, followed a path of cooperation with all groups and powers that wanted and supported the land’s independence. 3. The movement of national republicanism following the model of the Soviet Union. Among the members of the Uyghur intellectual class in 1930s and 1940s, in addition to the people mentioned above, there was a group of intellectuals who were influenced by the national republican ideas of the Soviet Union. The idea of a national liberation movement was propagated as far back as the Congress of the Revolutionary Uyghur Union in Tashkent in 1921. This was the first time that Uyghur intellectuals and nationalists from Eastern and Western Turkistan came together to establish an organization with a political program in order to provide for national liberation in the future. Even the Third International and the Turkistan Communist Party introduced the idea of an independent republic in the Xinjiang region. The Central Committee of the Bolshevik Party, under Lenin’s leadership, considered the idea of forming two republics, Kashgaria and Junggharia, as suggested by Latvian communist, Janis Rudzutaks, then chairman of the Turkistan Commission and of the Central Asia bureau of the Central Committee of the All-Russia Communist Party, but the Central Committee of the Bolshevik Party ultimately rejected the proposal.34 Later, however, the Moscow government and the Third International sent some clandestine agents to Xinjiang, and continued to investigate ways to foster a national liberation movement. Many of the Uyghur intellectuals in leadership positions within these organizations, including Abdulla Rozibaqiyev, Ismail Tahirov, Burhan Qasimov, Abdulhey Muhemmedi and Nezerghoja Abdusemetov, Ershidin Hidayetov, and others, aimed to sustain the independence of the Uyghurs and to form an independent Uyghuristan. In the Tashkent congress, which was held on June 3, 1921, they decided to use the name “Uyghur” to replace the former “Taranchi” and “Kashgars” parties36. At the same time, they agreed on using the Ili dialect as the standard for modern Uyghur. According to their aims, an independent Uyghuristan would naturally become a socialist independent national republic, similar to other republics in Soviet Central Asia. Some of activists in Turpan, Kashgar, and Ili who went to Soviet Russia and were connected with the Uyghur movement accepted the idea of an independent Uyghuristan and Uyghur nationalist ideals. Poet Abduxaliq, who was educated in Russia, adopted the term Uyghur and used it as his pen name— Abduxaliq Uyghur. He called his people the Uyghurs and rallied them to fight against Chinese rule and obtain freedom.37 Abduxaliq was also among the from indigenous Xinjiang Turkic thinkers to ponder on Uyghur national interest38 . The idea of establishing Uyghuristan became part of an official revolutionary movement among the Uyghur people, as demonstrated by events at the Congress of Tashkent. The idea of Uyghuristan was not just an ideology promoted by politicians. It also turned out to be one of the most important political ideals promoted by intellectuals, writers, and poets. identity, and of the Uyghurs’ fight for selfdetermination and political rights. Ethnic oppression by Chinese warlords and especially their discriminatory policies toward the Uyghurs should be mentioned when addressing the formation of Uyghur nationalism. That the oppressed came together as a group to protect themselves and fight for self-rule was a natural consequence of this oppression. Indeed, during the years 1931-33, all the towns and cities in East Turkestan were up in arms against Chinese rulers. The culmination of those rebellions was the declaration of the establishment the Islamic Republic of East Turkistan on November 12, 1933. The establishment of the East Turkistan Islamic Republic was evidence of the formal birth of Uyghur nationalism and the realization of Uyghur national aspirations. Through the founding of this independent republic, the Uyghurs asserted their distinct national identity and showed their determination to control their own destiny. In the beginning, the new republic was named the Republic of Uyghuristan, and it minted its first copper coins in the name of the “Republic of Uyghuristan.”39 Later on, the name was changed to the Republic of East Turkistan.40 The shortlived Republic of East Turkistan (1933-1934) established and spread its own political platform and educational and socio-economic policies. It also established its own publishing house, which published newspapers, textbooks, and journals that freely spread nationalist ideology. Uyghur intellectuals in this period played an important role in the formation and strengthening of Uyghur nationalism with the goal of achieving an independent state outside Chinese control. As the idea of a free Uyghuristan became the main goal of the national independence movement, Uyghur intellectuals and writers, through their own works, tried to bring together the people under that ideology, inviting them to join a common struggle for Uyghuristan. The theme of Uyghuristan was one of the most significant topics of Uyghur literature in the first years of Soviet Russia, and almost all Uyghur writers and poets wrote on this subject41. From 1933 to 1943, Sheng Shicai ruled Xinjiang with an iron fist. On Soviet advice and under their guidance, Sheng Shicai divided Xinjiang’s population into fourteen ethnic groups. At the same time, he refused to recognize the Uyghurs or other ethnic groups any national autonomy or political rights, and suppressed their national aspirations, including demands for a Soviet-style republic. During the period of Sheng Shicai’s control, some Uyghur leaders and intellectuals of the ETR believed that, with Soviet military, political, and economic support, Sheng Shicai promises would be realized and that they could participate in the provincial government. The Soviet Union did not allow the formation of an independent state by the Uyghurs in the 1930s42, but between 1934 and 1942, it sent experts and advisors to help the Xinjiang government in the fields of education, service, security, science and technology, and the military. Uyghur intellectuals were among these advisors. The Soviet Union also sent Uyghur intellectuals to Xinjiang in other overt, as well as covert, ways, and these people engaged in propaganda activities among the people. Sheng also promoted publications and education in languages other than Chinese, although, as in the Soviet Union, the main intent of the literacy program was to extend the reach of propaganda. He promoted agricultural recovery, and constructed schools, roads, and medical facilities.43 Sheng’s rule had strong overtones of Chinese chauvinism, triggering a new wave of nationalism among Uyghurs. Uyghurs from Eastern Turkistan who had studied or lived in the Soviet Union. Between 1934 and 1942, the Soviet Union was able to penetrate Xinjiang in the fields of culture and education, science and technology, and ideology, and included this region in its own sphere of influence. Reciprocally, the influence of the Soviet Union among Uyghurs, especially among Uyghur intellectuals, further increased. The desire of the Uyghurs to compare themselves with neighboring Uzbekistan, Kazakhstan, Kyrgyzstan, Tajikistan, and other republics, and their willingness to have the right to establish the Republic of Uyghuristan was strengthened. Between that time and the end of 1949, the government of this republic liberated the three districts of Altay, Tarbaghatay, and Ili, and formed an independent state in this region. Uyghur intellectuals again played a leadership role during the five-year history of the Eastern Turkistan government and during the political struggles for national independence for Uyghurs in the 1940s. The ETR established various social and education organizations such as a women’s association, a veterans’ foundation, and schools for orphans. Women from Muslim and non-Muslim ethnic groups participated in military, government, education, and work structures equally with men. The goal of the state’s battle was not to establish an independent Islamic religious state but to develop and learn from European modern culture, including the culture of the Soviet Union. The state held close relations with Uyghurs in the Soviet Union. The population of East Turkistan long had close ethnic, cultural, and economic ties with the Soviet Central Asian Republics, and Soviet influence had been strong among the local people of East Turkistan. Russian-Soviet culture exerted a dominant influence among the local population, via the Russian, Tatar, Uzbek, and Uyghur populations that had migrated from Soviet Russia in the early 1920s and 1930s. Immigrant intellectuals and intellectuals who had spent time in the Soviet Union constituted the majority of the ruling class of the Eastern Turkistan Republic. Almost all of them were influenced by the Soviet Union, and most of them were under the influence of ideals of national republicanism and self–determination for ethnic groups. The first members of the government and the cabinet of the republic were, just like in the first Eastern Turkistan Republic, the people who stayed or studied abroad, especially those who were trained in Soviet Russia. The president of the republic, Elihan Töre, had lived in Soviet Russia until the 1930s and achieved advanced levels of religious education in places like Bukhara and Saudi Arabia. He thus had a broad knowledge of religious studies and of the natural sciences, as well as good rhetorical skills.51 He shared many of the same ideas with the intellectuals who had attempted to establish an independent Eastern Turkistan Republic in the 1930s. Among the people who organized the liberation movement in Tarbaghatay were Ablimit Hajiyof, who had graduated from the Central Asian University of Tashkent, and other intellectuals who had graduated from the Xinjiang Institute and from the Military School in Ürümchi. In addition, many intellectuals served in leadership positions within the different ministries of the republic, as well as in newspapers, in the Ili Gymnasium, and in other positions. Many of them had graduated from schools including the Central Asian University of Tashkent, the Ili Gymnasium of Ghulja, Xinjiang Institute of Ürümchi, and various teaching academies. Almost all the intellectuals centered in Ili, Chochek, and Altay worked in the Eastern Turkistan Government as its employees. cow, as well as graduates of the Central Asian University of Tashkent, including, Seyfidin Ezizi, Ablimit Hajiyof, and Ibrahim Turdi graduated from Samarkand Agricultural College.57 Almost all the leaders in all departments of the “Union” had been educated in the Soviet Union, or in Urumchi and in Ghulja. In the various city and town branches of this organization, and in its military committees, intellectuals formed a majority. These intellectuals had common viewpoints about issues such as the future of Eastern Turkistan and its self-determination, and they hoped that if independence were impossible, they could nonetheless follow the Soviet Union as an allied republic with equal rights. The next leader of the Ili government, Ehmetjan Qasimi, who was a modern intellectual, had broad knowledge and a good understanding of the international system and of regional political issues. He supported the national republican ideas of the Soviet Union. These two leaders gave importance to the role of intellectuals and brought those intellectuals into their fold. They appointed these intellectuals to leadership positions in their governments. The republican government, under the leadership of Elihan Töre, mentioned in its nine-point declaration of statehood that the republic aimed to provide progress in the fields of culture, education, health, the arts, and other fields. The ETR had a secular and multi-ethnic state system.58 This republic brought together groups of different religious beliefs, diverse ethnicities, and socio-economic backgrounds, including Uyghur, Kazakh, Mongghul, Hui, Uzbek, Kyrgyz, Shibo, and Russian. It protected the rights of these groups and provided for their unity, and it determined accurate policies and strategies in order to defeat the powerful and common enemy. “The Union” and others were busy propagating the successes of the Soviet style governance in the fields of education, culture, economy and bringing up constantly the questions of the ethnic national questions, the national liberation and self-determination and questions of international politics. Newspapers and magazines in the territory of the ETR played an important role for the development of culture and the political understanding of the people. The ideas and principles of self-determination, the victory of Soviet style ethnicities policies, the policies of the Uyghur national liberation movement and alike were discussed by leading intellectuals like Ehmetjan Qasimi and others. Uyghur intellectuals, including leaders of the Ili government, namely Elihan Töre, Ehmetjan Qasimi, Abdukerim Abbasof, and others, frequently published articles on national liberation movements, ethnic and socio-economic policies, and on the political and cultural history of East Turkistan and the other various issues. Newspapers and magazines in the territory of the ETR played an important role for the development of culture and the political understanding of the people. In the determination of these policies and strategies, intellectuals played an important role. From its very beginning, the government of Eastern Turkistan put an extraordinary emphasis on education, the emergence of a class of intellectuals, and their empowerment. In line with this, the government of the Eastern Turkistan Republic adapted a policy of free, compulsory education. In Ili, mid-level experts were trained, and vocational schools established, such as Ili Bilim Yurti (Ili Institute of Learning) and Tibbiy Mektep (Medical Nursing Training School). Ili also attempted to promote four-year, seven-year, and ten-year long courses of study. In 1945 and 1946, there were 295 schools in the Ili region, more than 980 classrooms, 1051 teachers, and 28343 students. In 1947, the number of students increased 24 percent. It increased 25 percent in 1948, and in 1949, it further rose 30 percent. In 1950, it increased 41 percent.60 The economic situation of the students in Ili was better than it was for students in Ürümchi under the rule of the Kuomintang, and the level of education was as well. In its short five years of existence, the Eastern Turkistan Republic (or Ili government) emerged from nothingness and managed to establish independence, a flag of state, a regular army, state institutions, law and regulations, and other necessities of statehood. Thanks to its accomplishments in the fields of the military, politics, economy, culture, and education, it thereby created an example of self-determination for the Uyghurs in the 20th century. The intellectuals had common viewpoints about issues such as the future of Eastern Turkistan and its self-determination, and they hoped that if independence were impossible, that they could follow the Soviet Union as an allied republic with equal rights. 5. The idea of high-level autonomy based on the ideology of Turkism? Although they had a common final goal, their disagreement on which external power to use temporarily created a major rift between them. Intellectuals referred to as “üch ependi,” namely Mesud Sabri, Muhemmed Imin Bughra, and Eysa Yusuf Aliptekin, preferred to negotiate with the Chinese Kuomintang government, through which hey were planned to gain rights to a high-level of autonomy64 within China and to reform the Chinese constitution in order to change the name Xinjiang to Turkistan. They were against the nationalities policies of the Soviet Union, which paved the way for a division of territories and for classifying groups as Uyghur, Kazakh, Kyrgyz, and Uzbek, and were in favor of a common Turkic national ideology. Because they were against the Soviet Union, they were more favorably disposed toward the central government of China. They also were supportive of countries like the United States, Britain, and Turkey during the Cold War, and promoted the idea of cooperation with these countries. On the other hand, intellectuals of Ili under the leadership Ehmetjan Qasimi were in favor of an armed insurrection, with backing from the Soviet Union, in order to determine the future of East Turkistan. These intellectuals opposed the Kuomintang government of China. omous rights. After being divided between the Soviet Union and the West during the Cold War, both groups of Uyghur intellectuals ultimately lost influence. In the first half of the 20th century, a Uyghur intellectual class whose members were trained in modern schools, witnessed a phase of new development. The formation and development of Uyghur intellectuals took place in a broad region, including Central Asia, Turkey, the Middle East and Eastern Turkistan/Xinjiang. Although these intellectuals lived in different regions of the world, had citizenship of different states, and were under the influence of different ideologies, they always thought of themselves in relation to their Uyghur national identity and the territorial identity of Eastern Turkistan. During their emergence and development, they were influenced by different ideological currents, including communism, Turkism, and Islamism, and they tried to apply these theories to the Uyghur independence movement. Intellectuals played prominent roles in two Republics of Eastern Turkistan. The leadership cadres of these states were formed by these intellectuals. And they also constituted the core of the government and the military. Especially during the National Liberation Movement of 1944-1949, the role of intellectuals was further consolidated, and the government that lasted for five years was administered by Uyghur intellectuals. The first Eastern Turkistan Republic was abolished by the Soviet Union. Although the second Eastern Turkistan Republic or Ili Government was supported and protected by the Soviet Union, at the end of the day, it became a victim of the Soviet Union, as well. Eli in Almaata and sent them to Xinjiang. The Soviets also sent some Uyghur intellectuals to the East Turkistan Republic as political, military, and administrative advisors. Within this environment, the Soviet Union supported and reenergized the independence struggle of the Uyghurs and other native peoples in Xinjiang province in order to establish its own influence in the region and dislodge the influence of the United States and Great Britain from this corner of Central Asia. The role and involvement of the Soviet Union in the ETR and Xinjiang’s political life in 1944-49 was not reflected in the works of Soviet Russian historians until after the collapse of the Soviet Union. This was due primarily to the closed nature of the archival materials that were able to shed light on these issues. During the Cold War period almost all Western scholars who studied Sino-Soviet relations and Xinjiang, using some Chinese and Western diplomatic sources, concluded that the Soviet Union was deeply involved and played a key role in the establishment of the ETR and its military, political, economic, and other activities.65 But, they could not clarify their points with information from original Soviet documents. However, after the mid1990s, when Russian scholars started to open the archive documents relating to the Soviets involvement in the ETR, it was possible to shed light on the fact that the developments were part of the Soviets’ preconceived plan. According to secret Soviet archives that were opened after the collapse of the Soviet Union, Stalin’s politburo decided to organize and support the national liberation movements in Xinjiang province.66 Until July 1946, high-level Soviet political and military advisers came from Moscow and regularly stayed in Ghulja, providing aid to the ETR.67 More than 2000 soldiers and 500 officers from the Red Army served in the National Army of the ETR,68 which numbered 30,000 soldiers. The struggle for independence grew nationwide, and the Chinese Kuomintang government in Urumqi faced the possibility of defeat. At such a critical time, Stalin forced the East Turkestan leadership to compromise and negotiate with the Chinese Kuomintang government. Different ideas among Uyghur intellectuals, including establishing an independent state, attaining higher autonomy, or accepting the Soviet model and forming an allied or autonomous republic, completely failed in the end. There were domestic and external reasons for this. Different ideas and disagreements among intellectuals were related to the destiny of their own people. Each faction claimed that its ways and methods were best. At the same time, Uyghur intellectuals on both sides of the border in Soviet Central Asia and Xinjiang became victims of the purges of Stalin and Sheng Shicai in 1937-38, and the new Uyghur intellectual elites that emerged in the 1930s were destroyed by the dictators of that period. “Three Misters” in Ürümchi, had pan-Turkist or Pan-Islamic aims. The division of the Uyghur intellectual class in the 20th century was a reflection of international and regional ideological and political competition in Eastern Turkistan and among the Uyghurs. The leadership of the first Eastern Turkistan Republic was formed by the individuals who were influenced by the Turkism and Islamist awakening movements, which emerged at the beginning of the 20th century, but their statist ideology based on Turkism turned out to be a victim of the complicated external and internal political situation in Eastern Turkistan and Central Asia, as well as of the conflict of interests and power struggles between the great powers. The intellectuals and leaders of the first republic were eliminated by the Soviet Union and its Chinese proxy Sheng Shicai. Their defeat was a loss felt by generations of Uyghurs. After 1946, the new dream of some Uyghur Intellectuals and Ili leaders, including founders of the People’s Revolutionary Party, such as Abdukerim Abbasof and others after 1949—those who believed the Chinese communists’ earlier promises of self-determination for national minorities— was that the PRC would establish Soviet-style republics. In the end, however, Mao didn’t recognize the right to self-determination of the Uyghurs, Tibetans, Mongols, or others. Chinese leaders justified their choice by explaining that China’s situation was different from that in the Soviet Union. In 1955, two years after Stalin’s death, Mao Zedong passed over Stalin’s ethnic autonomous republic policy for the Uyghurs, a system some Uyghurs had hoped he would follow, and decided instead to establish regional autonomy in the province, renaming the area the Xinjiang Uyghur Autonomous Region. Many former ETR leaders and intellectuals looked to the leadership of this autonomous region with new dreams. After the Qingdao meeting in 1957, at which Chinese premier Zhou Enlai strongly criticized former ETR Uyghur nationalists, some Uyghur nationalists immigrated to Soviet Central Asia. Some of them died or were assaulted during the Cultural Revolution.